Twin core retractable cable with 2 x 1.0mm2 PVC insulated cores sheathed in black polyurethane. 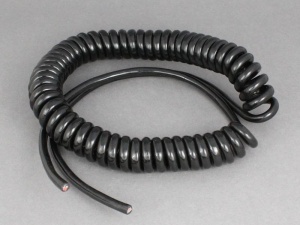 The sheath has been formed in a permanent, non-kink coil and is 1m in length retracted with a 3m working length (approx.). Ideal for non-permanent connections such as cigarette lighter plugs etc. as it eliminates the trip hazard of trailing cables and is compact for easy storage. As described, arrived on time and a good price. Have used these with some Cliffcon low voltage plugs on either end to power some LED work lights from a single battery box. The result is better than a shop bought product. Tails are a good length. Ideal for the job in hand , speedy delivery as always, carnt fault the service. The product matches perfectly the description and was sent immediately. A quality product with good flexible insulation. very good quality, the tails, straight bits, a bit longer than I needed but just fine. Nice, heavy duty cable with thick insulation. Ideal, as i'm using it as an umbilical cord for connecting a battery conditioner.